Like new house and voted 'Most Photographed Home on the Island'. Casa de Jaguar lies at the more private, south end of Isla Mujeres. This Mexican-style hacienda overlooks the Caribbean Sea from all it’s lovely verandas, porches, and the large heated Infinity pool. Up to 9 guests can enjoy this home. We are doing our part of 'Going Green', saving island resources. Installed our own transformer, adding new solar hot water system and enjoy our heated pool in the winter months. Also, whole house water softening system. More to come. Enjoy your morning coffee, watching the sunrise from your veranda or venture upstairs to 2nd floor to enjoy 360 degree views of Isla and over to Cancun. This incredible house will meet all your needs, from a gourmet kitchen, entertainment center, home office, WIFI Internet throughout, washer/dryer, barbecue, indoor and outdoor dining areas, all king-sized beds, and much more. Spend your days relaxing in the pool or take off to town to stroll through artisan shops or enjoy the outdoor cafés. Isla Mujeres (Island of Women) is a quick ferry ride 8 miles across the bay from Cancun. This beautiful island, 5 miles long and half a mile wide is like taking a step back in time. Pristine beaches, snorkeling, diving, deep-sea fishing, a turtle farm, in season whale shark tours and dolphin swim are but of a few of the things to see and do here. No need for a car, hail an island taxi or rent a bike, moped or golf cart and set off on your own tour. Browse through the local crafts in the downtown area, and dine at any number of restaurants serving all types of cuisine. If you’re up for it, venture out to the colonia's for a truly authentic Mexican dinner. There’s plenty of night life, from street entertainers to night clubs. Isla Mujeres offers it all in a smaller, more quaint atmosphere, free of the stress and hustle-bustle of the large resort areas. Once you've come to Isla, you’ll come again and again, or perhaps do as some have done and come to stay. Gorgeous, uninterupted Caribbean View 365 days a year. Very Small island, unique location; yet easy to get to. Mexican hospitality. There are so many things to do here. After so many trips to the beautiful island we still find something new and exciting each and every trip! Relax and do nothing, go fishing, deep sea fishing, snorkeling, diving. Go to the turtle farm, swim with the dolphins, sea lions and manatee @ the Dolphin Discovery, go on whale shark tour and swim with them. It's endless. 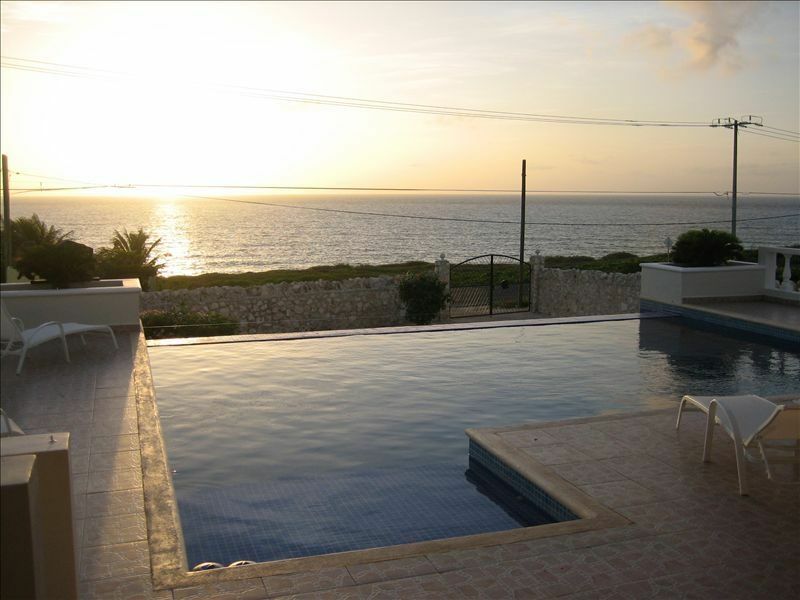 Unobstructed view, there are no obstacles between the property and the Caribbean. The washer and dryer is on the main floor. Bath towels included for each of the 4 baths. All 4 rooms have wireless access. Ice maker utilizes bottled water for drinking and ice. in kitchen and in both upstairs suites. Enjoy a book from our collection, feel free to leave or exchange a book also. We love to see the library collection change. The main floor only will accomadate wheel chair access. Smoking is only allowed outside the home. Please dispose of butts properly. Infinity with a heat pump for the cooler days in the winter months. Amazing house, awesome private pool! Perfect for 4 couples! We only had three couples, each had their own space...bedroom, bathroom and shower. Sunrises are beautiful. Spent most days in the pool after we bought floaties. The power was down two of the days; which put a damper on our ice supply and blended drinks. We text Armin and he told us it would be back on in two minutes....over four hours later we gave up and left. Other than that, it’s going to be very hard to find another house on the island compareable! This was one of the couples second stay at Casa De Jaguar. Polo Mangos...best breakfast!! Fuego de Mar....best dinner! My family of 7 loved this house during our stay from February 1-9, 2019. Gwen was wonderful to work with before and during our stay. She didn't get sick of the millions of questions I had for her. That said, I would recommend anybody with a family group to stay at Gwen and Fred's lovely home. The house has 4 very well appointed bedrooms and 4 bathrooms. There are chairs for lounging by the pool and all the modern appliances in the kitchen. The housekeeper came during our stay and it was nice to come home to a clean house after spending the day at Captain Dulche's Beach club. Armin,the house manager was a blessing. My son's mother-in-law from Equador came on this trip with us and she wanted to make fish. I asked Armin about where we could get fish and he brought us two huge red snappers freshly caught. Maria cleaned and prepared the fish and my sons grilled them. It was outstanding and probably the best meal we had the whole time we were on the island. There is plenty of room to spread out so you don't get on each other's nerves. Lastly we took Gwen's suggestions for some places to eat on the island. I loved the Chili Relleno at Basto's Grill. I highly recommend Fuego de Mar. The chefs at this restaurant were awesome. We went to North beach a few times and it is less expensive than Captain Dulche and Zama Beach clubs but the beach at Zama was awful so I don't recommend this place. Captain Dulche was great but really expensive for what you get. At any rate, I will definitely try and come again to this house especially if I bring my extended family. The house also makes for a great two family retreat as the two bedrooms upstairs are large and the view is fantastic. Every bedroom locks so there is plenty of privacy. By the way if you were ever worried about security on the island don't even let it be a factor. Gwen provides locks not only to every bedroom but to the safes in each room, to the screen doors and hardwood doors and to the front gate. A real fortress!! My highest and best rating goes to Casa de Jaguar. We had an absolutely wonderful family vacation ! Casa De Jaguar is absolutely stunning the house is beautiful and the pool was a great temperature not just for the kids but for us adults too ! Armin was alway available for questions and help we even asked about where to get a piñata and to our surprise when we got home he had delivered 2 to us !! the grounds are beautiful and well kept ! Casa De Jaguar is a lovely home we can't wait to come back !! Thank you for sharing your beautiful home with us !! The view from the house and pool to the Caribbean was amazing. The house was not only beautiful but it accommodated everyone perfectly. The manager’s services was impeccable and welcoming. We’ve been going to the island for about 20 years, first time to VRBO, at Casa Jaguar. Couldn’t have picked a better house for our little family reunion. Convenient, very clean, and Armin was most hospitable in meeting our specific arrangements, including golf cart rentals. This house was perfect. We felt like rick stars. Armin set up transportation before hand the golf carts were waiting for us at the house and much cheaper than what we would have paid of we got them. I will rent this house again every time I go back. Boat tours, Fishing, Turtle Farm, Dolphin Discovery, Garrafon Park, the new waterpark, Whale Shark tours in season.